Marketing gets a bad rap when you’re a spiritual person. People think it’s all about ego and that promoting yourself or your business is somehow impure or wrong. When you start a business, you do it because you believe in it. Taking the entrepreneurial leap is scary and super exciting, and your passion and commitment are absolutely required. There is no phoning it in when you run the show. You start and run a business because you LOVE what you’re offering. You take your business seriously, nurture it and give it every chance to flourish. Therefore, it’s your responsibility to find the people who want what you’re offering! This is why I’ve become unapologetic about marketing. You owe it to your business to get the word out, and you owe it to the world to share your passion! Over my 17 years as an entrepreneur, I’ve heard tons of marketing advice and tried all kinds of techniques. And time and time again I’ve seen that there are a handful of tips that always work. These are the marketing tips I swear by. They are a huge part of the reason for my success as an entrepreneur. Today I want to share them with you. If you run a business or dream of starting one, save this blog. Try these marketing tips. Read all the way to the end and know that I don’t share these lightly. Commit to these marketing tips and expect miracles. 1. All you need are 1,000 true fans. I first read this amazing piece of advice in the blog post “1,000 True Fans” by Kevin Kelly. He first published it in 2008 and has since updated and added to it (the revised version is in Tim Ferriss’ book Tools of Titans). One of my big takeaways from this post is to start where you are. I started my business with about 100 people on my mailing list. I cultivated that list, built trust and held space for a community of Spirit Junkies. Now I write books and speak on stages around the world, and from that little list I’ve manifested a movement of lightworkers! Whatever your list is, focus on serving your true fans, reaching out to more of them and growing that list. These true fans will be your tribe and will spread the word of whatever it is you’re offering to like-minded people who will join the community. 2. 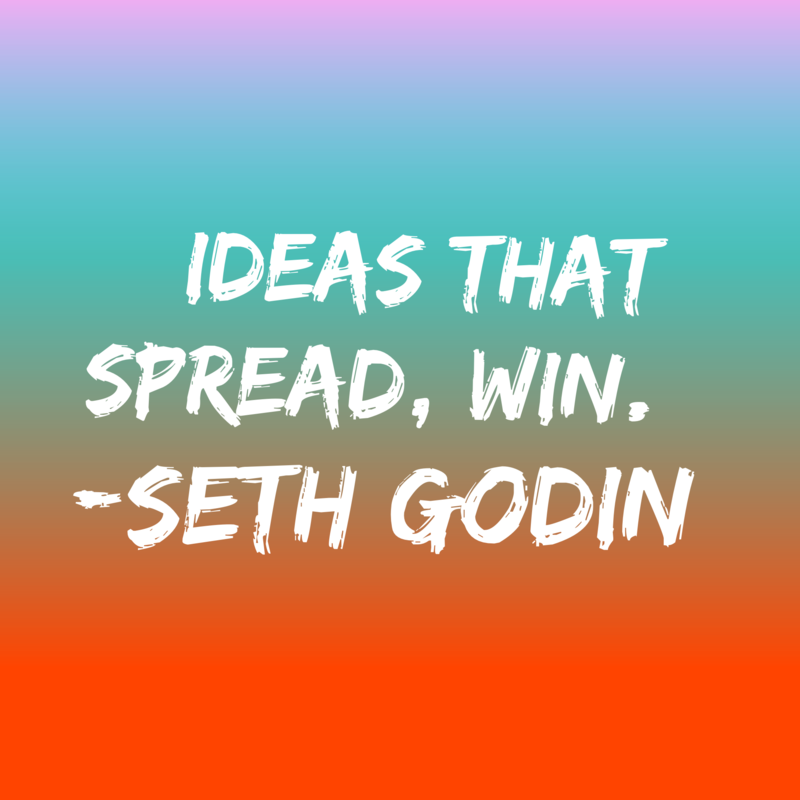 Ideas that spread, win. The bestselling author and former executive Seth Godin gave an iconic TED Talk back in 2003 about how to get your ideas to spread. These days people have tons of options and very little time. If you want to be noticed, your idea has to be remarkable — as in, something different and worth talking about. Instead of trying to appeal to everyone, focus on a niche. Appeal to early adopters and the people who will geek out over what you’re offering. They will then spread your idea to others, who will spread it to others. Seth gave this TED Talk years before social media and before we got obsessed with things going viral online, and his point has only become more important! Ideas that spread, win. This is why I am unapologetic about who I am and the message I feel called to share. The Spirit Junkie approach isn’t for everyone. And when I started out, spirituality wasn’t nearly as hip and mainstream as it is now. But I knew that my message stood out and resonated with a small but loyal tribe of people, and I spoke authentically and with conviction. Those “early adopters” became Spirit Junkies who helped me (and still help me) spread the message to a far greater audience and create a movement! 3. Eavesdrop on your customers. The best way to market your product or service is to speak authentically and in a way that resonates with your prospective customers. To do this you need to know the problems they need solving and the things that hold them back from buying. And you can’t guess at this! You need to listen to people. Every time I launch a product, whether it’s a course or a book, I talk to different kinds of Spirit Junkies and survey people to learn their stories. Ask people to reply to an email you send. You can send an automatic reply whenever someone joins your mailing list asking them a question that will help you create products/services they need! Derek asks people to tell him one thing they’re struggling with right now, even if it’s small. Create anonymous surveys. People are likely to answer more honestly when they know they’re anonymous. Encourage people to leave smart comments on your blog, YouTube videos, etc. Do this by deleting spam, responding thoughtfully to comments, answering questions, etc. These tips are awesome because you can take all this feedback and learn not only what your customers want, but how they talk. Pay attention to the words and phrases they use so you can speak to them in a way that really resonates! 4. Commit to a clear vision. My good friend Lewis Howes talks about how crucial it is to have a clear vision of what you want for your business. Before you can market your business, you have to get clear about what you want and what you’re working toward. Otherwise you run a million directions and you never gain momentum. You get easily distracted and weighed down by the day-to-day grind. You can free-write your answers to these questions in a journal or a Word/Google Drive document. Simply let yourself write for 5 or 10 minutes without editing a word. Spirit Junkies, this point is so important. The online world is always changing, and you need to keep up in order to market effectively. Here’s just one quick example: After my team and I had created our whole marketing plan for my book Judgment Detox, Instagram rolled out Instagram Story ads. We had to quickly regroup, go back into our plan and create really strong ads in this new format. You can keep educating yourself on marketing by reading the latest social media news, scoping out new books on marketing, going to seminars, taking courses and paying attention to what influencers in your field are doing. Get on the waitlist for Spirit Junkie Masterclass Digital Course! 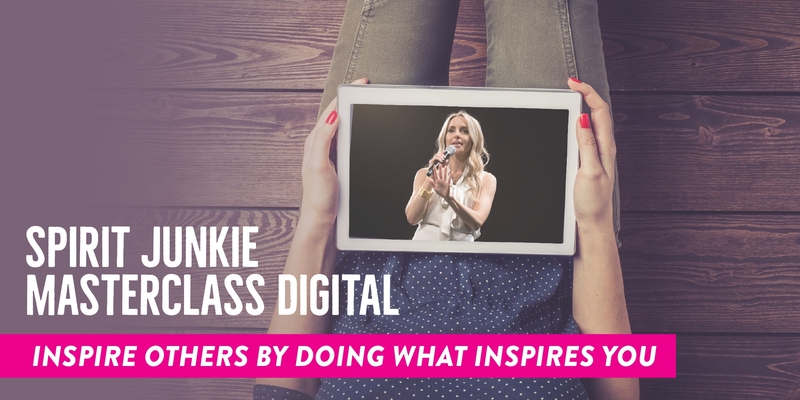 Spirit Junkie Masterclass Digital Course is no ordinary training. It’s a transformational deep-dive into how to share your empowering message and make a difference. Your marketing efforts will pay off big-time. Your ideal clients will start showing up with less effort. You’ll make a bigger impact. You’ll earn the kind of money that provides the freedom and lifestyle you crave. And you’ll greatly serve the world. Hi Gabby, I really appreciate your idea about eavesdropping on your customers. I’ve done anonymous surveys in the past! I would love to try the email sign-up question! Personally my new blog has been around for about a year now and I am enjoying working toward gaining my first 1000 true fans. What if none of my subscribers answer my survey questions or respond to my emails questions? You can reach out to people directly. Send an email to friends asking them to share with others. Post on social media asking folks to take an anonymous survey (provide a link) or DM you for more info. You will find people who are happy to answer some questions, give you feedback and share their stories. Many thanks for sharing these tips. As a new entrepreneur I am still working on building a social media following. Something that I strive for, but have not yet achieved is post engagement – to get people talking, sharing, connecting. I am hoping that with more time in, consistency, and offering of my authentic self, my true fan base will grow. Thank you Gabby for sharing these amazing tips!! I love you and Marie! You two are such role models for me! I took B-school a year ago and I am now launching my first wellness program online. I am looking forward to becoming an official spirit junkie too! ( I mean taking your courses) I have been following your work for the last six months and I just love you! It was louise Hay who directed me to you!, I was reading some of her books and from that landed on her page and say your beautiful face, and it was love at first sight (hahaha, kinda of feels that way!) I recently bought “Judgement detox”, and we’ll be buying “The Universe has your back” after I complete the exercises from judgement detox! Thank you so much again for all you do!!! Amazing!!! You are already an “official” Spirit Junkie if you’re here 🙂 I’m so happy that what I am sharing resonates with you. Take your time with Judgment Detox and enjoy the freedom that the process offers. Congratulations on launching your first program… expect miracles. Thank you so much for sharing! I love these tips. I signed up for B-School through you last year and I’m so excited to go through the course again this year for FREE! There was so much to learn that I think I missed a lot last year. I’m still figuring out the whole marketing thing out as well, so it’s great to hear what has been working for you. Thanks for sharing this, Gabby. I’m moving into a new job that involves some marketing and this leaves me feeling much better about the move. I watched the first video and loved it! Do you make a commission on promoting Marie? If so I think you’re supposed to let us know that legally. Thanks so much for sharing! Want to open my own business as well and these tips, especially the first one are so inspiring! Thank you so much for this! I am a portrait and boudoir photographer who wants to do more than just take photos of women to make them feel beautiful, but help them change their lives through self-love. I will be looking into all of these tips! I *love* this!! Use these tips. Get the word out and light up the world with self-love!! !